The Dalite 156 x 204" 4:3 Drapery Presentation Kit for Fast-Fold Deluxe Screens is a great way to add a touch of professionalism to your presentation. The drapery system provides a neat and finished look to the screen. It is a fire-retardant cotton velour drapery that attaches with snaps to Fast-Fold screens to enhance the image and ensure that your audience's attention remains fixed where it should be. 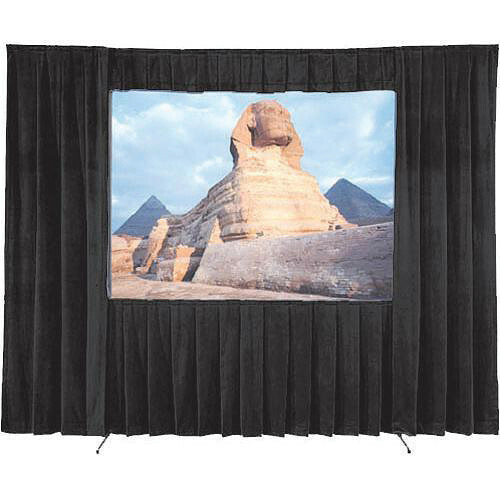 Note: This drapery kit is compatible with Da-Lite Deluxe Screens. The Fast-Fold Deluxe Screen System is designed for rental and staging environments, and features easy release latches on the frame for efficient set up and tear down.